East Texas (KLTV) - Here is the Weather Where You Live... 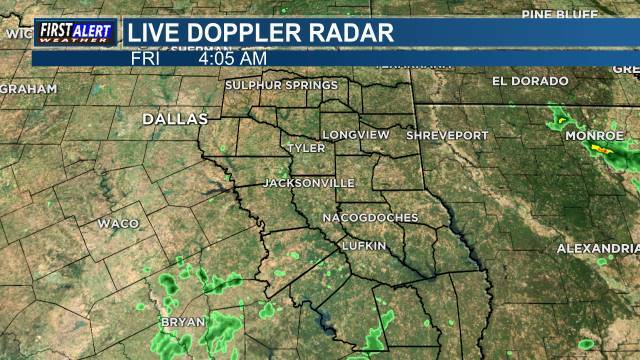 The advertised cloud cover has moved into much of East Texas and will continue with a partly to mostly cloudy sky through the upcoming weekend. A cold front is expected to move slowly through East Texas on Friday but not much rain is expected at all. The big weather impact over the next few days will be the wind during the day on Thursday...tomorrow. A southwesterly wind is expected at 20-30 mph with gusts near 40 possible. Less wind on Friday and into the weekend. Another cold front is likely late Tuesday or early on Wednesday of next week allowing rain to move back into East Texas. Only looking for rain with this front. No real chances for severe weather expected. Temperatures are expected to be fairly warm/above normal through Sunday before we see temperatures drop below normal.